What is exercising? Sweating in the gym, running in a marathon, or showing off fitness meal, sweaty selfie, mermaid lines, firm abs and other kinds of lines in the Moments? In my opinion, people with the aforementioned activities are only at the threshold of doing exercise and are still outsiders. And when you are an insider, you will find that doing exercises is a kind of self-discipline and also tempers yourself. It tempers not only your body but also your spirit, making you firm and persistent. So, when talking about the meaning of doing exercises, after a long-time reflection, I think the word “tempering” might be the most appropriate one in explaining. In September, the beginning of Autumn, a season known for storing fat, Kangde Group correspondingly customized a three-months activity for its employees themed Sports Season for Energetic Kangde People, fighting with fat with vitality and health, fully lightening the energetic work season, and boosting healthy workplace. Till the end of September, more than 60 employees signed up. More than 20 employees do exercises each day on a average. The daily average time of doing exercises is 60 minutes. The exercises include instrument training, theoretical open class, Yoga, Pilates, TRX, swimming, boxing, etc. “Let’s do some exercises after work!” This sentence seems to be the pet phrase of our employees since September 3, the first day of the activity. Employees change from having dinners together after work to doing exercises together and talk about and discuss their fitness skills at the intervals of working. There is a saying on the Internet that fitness is the second thing after eating that can be seen as long as you make efforts. “Continuously challenge yourself. When your body reaches the limit, you are the winner if you do one more.” Employees encourage each other like this. Insistence is the only motto of fitness. At 18:00 on the evening of September 7, Kangde Group conducted an open class exclusively for Kangde employees at the Norberman Fitness Club. In the class, the private coach explained the common sense of doing fitness and explained the common occupational diseases of employees, for example, for long-time sedentary office staff, the way to adjust the sitting posture to avoid lumbar discomfort and use some simple exercises to relieve the discomfort of shoulder and neck. In addition, the private coach also corrects some of the wrong actions common in exercises. Health has always been the focus of Kangde Group. The Group regularly organizes employees to do physical examinations every year and encourages them to participate in community sports games, vitality runs, Chongqing marathons, and hiking cross-country races. The team participates in outdoor activities for averagely about 5 times a year, with an average of about 50 people participates each time. “Sports is about persistence. Never give up. I also hope that employees can work hard and have tenacity while doing things. 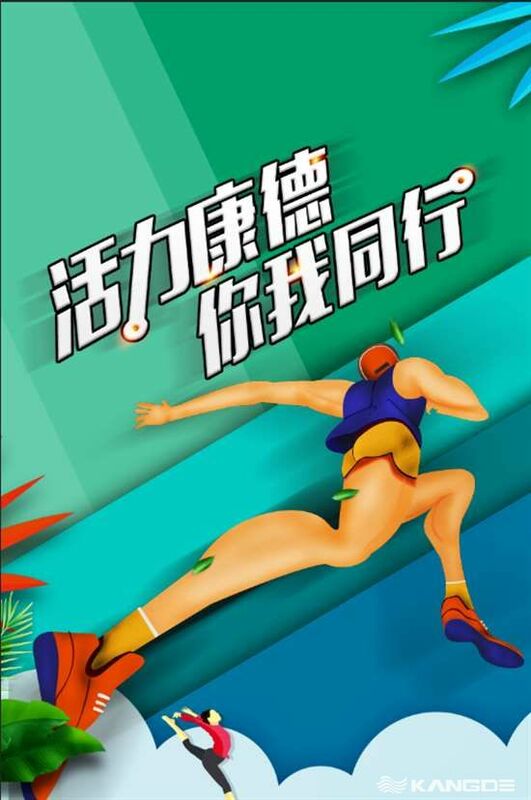 Just as said in the iron training of Kangde Group, nothing is impossible, but there is no possibility if you do nothing.” The spirit of sports, frequently mentioned by Chairman Lu, has already become a cultural flag of our Company. Can anyone work in high intensity all the year round without rest, sleep only 5 hours every day and at the same time insist on doing exercises? I think the answer is “No”. But in Kangde, the answer is “Yes”. That is the capital of Kangde Group, Chairman Lu Chaokang. Every mention of this capital reminds employees of his strong heart and tenacious willpower. Under the leadership of Chairman Lu, the middle and senior management of Kangde Group has been insisting on fitness and inspired a sports boom in the big family of Kangde Group. In future, the spirit of sports will flourish in the culture of Kangde Group, infiltrate into the daily life of employees, and integrate health into the workplace. The Kangde big family will also join hands together and climb one and another peak with stronger willpower.